The House on Thursday passed a sweeping tax bill largely along party lines that makes good on a Republican campaign promise to reform the country’s tax code. The bill passed 227-205. Thirteen Republicans voted against it. But the future of the Senate version, which includes a repeal of ObamaCare's individual mandate, is still very much up in the air. Several senators have wavered on support for the legislation, which the chamber is still negotiating in committee. The House “Tax Cut and Jobs Act” was pitched as a plan to help middle-income Americans, by raising the standard deduction and simplifying the code, including collapsing tax brackets to four from seven. Republicans aggressively marketed their plan as something that would benefit everyone but critics said much of the financial gains would go to the wealthiest Americans and big corporations. The final version scaled back some popular deductions while cutting the corporate tax rate to 20 percent from 35 percent. 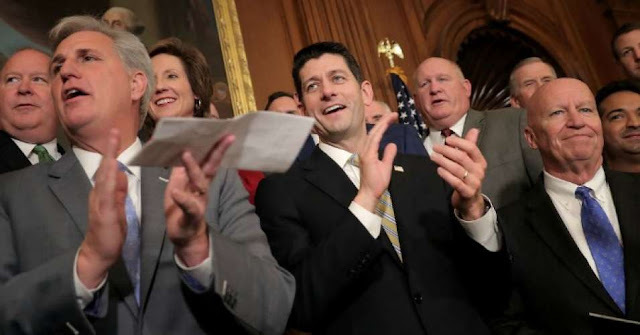 New York Rep. Pete King, one of the most ardent opponents of the proposal, called the House bill “an unforced error,” and suggested it could come back to bite Republicans in next year’s midterm elections. King was part of a small group of House Republicans from New York and New Jersey who rebelled because the House plan would erase tax deductions for state and local income and sales taxes and limit property tax deductions to $10,000. The Senate version, which is working its way through the Finance Committee this week, is facing a lot of obstacles, including pushback from GOP senators. Sen. Ron Johnson, R-Wis., announced his opposition Wednesday to the GOP's tax bill. GOP Sens. Susan Collins of Maine, Jeff Flake of Arizona and Bob Corker of Tennessee have expressed concerns about the bill but have not signaled which way they would vote. “Through regular order and an open and transparent amendment process, the members of the Senate’s tax writing committee are also making real progress on a bill that’s been years in the making to fulfil our promise to the American people,” Senate Majority Leader Mitch McConnell said after the House vote. Earlier Thursday, President Trump visited Capitol Hill to meet with House Republicans ahead of the vote. "He told us that we have this once-in-a lifetime opportunity to do something really bold, and he reminded us that is why we seek these offices," Rep. Steve Womack, R-Ark., said of Trump's closed-door pep rally. "And here we are on the cusp of getting something really important done." Some House Republicans spoke warily of what might happen to the tax bill in the Senate. "Political survival depends on us doing this," said Rep. Kevin Cramer, R-N.D. "Frankly, one of the things that scares me a little bit is that they're going to screw up the bill to the point we can't pass it." The House measure would collapse today's seven personal income-tax rates into four: 12, 25, 35 and 39.6 percent. The Senate would have seven rates: 10, 12, 23, 24, 32, 35 and 38.5 percent. Each plan would erase the current $4,050 personal exemption and annul or reduce other tax breaks. The House would limit interest deductions to $500,000 in the value of future home mortgages, down from today's $1 million, while the Senate would end deductions for moving expenses and tax preparation. Fox News’ Barnini Chakraborty and Chad Pergram and The Associated Press contributed to this report.